Increase your store's visibility to thousands of readers with our Magazine Profit Program! 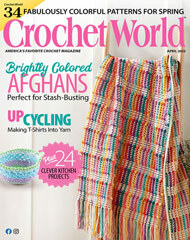 Free shop listing in Crochet!, Crochet World, Quilter's World and Good Old Days! We want to partner with you to build your business. When you sign up to automatically receive 6 or more of each issue of Crochet!, Crochet World, Quilter's World, your shop will receive a FREE mention in the shop listing section of that magazine. It will remain there as long as you remain active in the program. ...over 44,000 readers of Crochet. 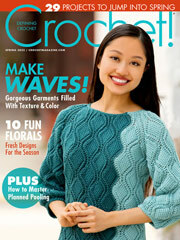 ...over 90,000 readers of Crochet World. 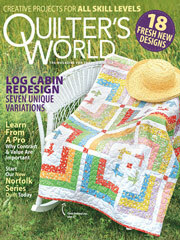 ...over 70,000 readers of Quilter's World. 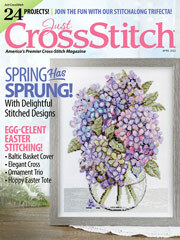 ...over 36,500 readers of Just CrossStitch. Best of all, our Automatic Magazine Program makes it easy to keep your magazine selection up-to-date and eliminates the hassle of re-ordering every month. New issues will automatically be shipped to your store as they are released. Of course, your standard wholesale discount will apply to your purchase of the magazines. Want to learn more ways you can build your business with our Automatic Magazine Program? Plan a class around one of the many fashion-forward projects found in our magazines each month. In addition to selling a magazine to each student, you will also gain incremental profits from sales of corresponding materials needed for the project. Use the magazines as free prizes for drawings at the end of every month. This will allow you to initially capture more information about each customer that walks through your door. And, if they win, they must return to pick up the magazine, giving you more time to build a relationship with that customer and learn how you can best meet their crafting needs. Cross-merchandise. Pick a project to highlight and merchandise the magazine in a high traffic area along with the corresponding necessary materials. Make a small sample of the finished project and include it as well. A sample is worth a thousand words! Magazines have the unique ability to drive consumer purchases in other categories -- in your case, this means tools, yarns, fabric and various other crafting supplies. Take advantage of this and cross-merchandise. Customers want magazines. They are smaller investment than books, and they are opportunities to test the waters without spending a great deal of money. And according to the Magazine Publishers of America one third of consumers who don't find the magazine they want in a store will go to another store to find it and buy it. Magazines are a Power Category in retail. They rank in the top 10% of total retail category revenue and generate in excess of $4.5 billion annually. At least 79% of our loyal readers save their issues for future projects/reference. This equates to long-term business for your shop -- far beyond the magazine's cover date. More than 78% of our readers indicated that magazines were their #1 source of inspiration for projects, ranking far ahead of books and Web sites. Magazines have desirable category metrics. These include high margins, high turns and low labor investment -- especially when you consider you only have to order once with our Automatic Magazine Program. Uncover the opportunities and unleash the potential of Annie's magazines in your store. Contact your sales representative today to learn more about how your business can benefit from our Automatic Magazine Program or call our Customer Service Department at (800) 772-6643 and sign up. We'll get you started with the very next issues of the magazines of your choice.